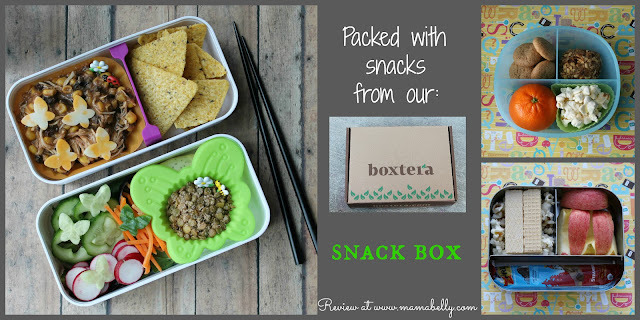 Boxtera generously sent me their April box to review. Boxtera provides a monthly subscription service and delivers natural products with wholesome ingredients. They strive to include products that are gluten-free, organic, sometimes vegan but always minimally processed. This box is great if you feel that 5-8 snacks is not enough for a monthly subscription box. Boxtera includes 23-25 servings! Plenty of different snacks for school, work and on the go! Flap Jacked Cinnamon Apple Protein Pancake Mix- 4oz. package. We had plenty of snacks to work with and everyone from the kids to my husband enjoyed the special treats in their snack and lunch boxes. Overall, we liked most snacks and discovered a few new favorites! This school snack contains some of the Home Free Mini Vanilla Cookies, the Amy Lou's Almond Butter Ball, a tangerine and some popcorn. Another school snack is packed with popcorn topped with two of the Helwa Vanilla Wafers, apple bunnies and the Cliff Kid Z fruit rope. left over salsa chicken with a few of the Garden of Eatin' Black Bean Tortilla Chips, a salad topped with cucumber, cucumber butterflies, radishes and carrots and The Perfect Snaque Seasoned Sprouted Lentils, with Cinnamon Sugar. --> Overall, I have to say that the box is very generous. There were snacks a plenty even if not everything was liked by everyone. We all tried new snacks and found many new favorites! 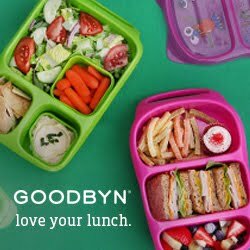 This box is definitely for you if you would like a greater variety of snacks and prefer all natural minimally processed foods. The monthly subscription starts at $35/month with $5 for shipping but if you sign up for 6 or 12 month your box becomes less expensive. If you would like to try Boxtera use coupon code LWL613 to receive free shipping if you sign up for the month to month subscription!